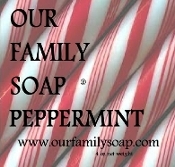 Our basic soap with the stimulating freshness of Peppermint oil. A scent that pleases all your senses. Coco butter adds extra softness to your skin. Saponified olive oil, coconut oil, palm oil, peppermint oil, coco butter and vitamin E.